number of instances since that time. God and the Virgin Mary. freedom abroad, applauded the passage of the Canadian legislation. freedom of expression, were vaguely worded, and carried unduly harsh penalties for violators. Statistics report released by the FBI’s Uniform Crime Reporting (“UCR”) program. Law enforcement reported 7,175 hate crimes to the UCR in 2017, up from 6,121 in 2016.
data to the FBI’s UCR program. sexual orientation, ethnicity, gender, or gender identity. still a bias crime because the offender was motivated by bias against the group. A total of 16,149 agencies across the country report hate crime statistics to the FBI. in Pennsylvania, and 74 in New York.  27.5 percent of hate crime incidents occurred in or near residences/homes.  17.0 percent took place on highways/roads/alleys/streets/sidewalks.  10.5 percent happened at schools/colleges (based on three designations).  5.8 percent took place in parking/drop lots/garages.  4.1 percent occurred in churches/synagogues/temples/mosques.  2.7 percent took place in restaurants.  1.9 percent occurred in commercial office buildings.  1.8 percent occurred at parks/playgrounds.  1.6 percent happened in air/bus/train terminals.  1.6 percent took place in government/public buildings.  1.5 percent took place in convenience stores.  1.4 percent happened in bars/nightclubs.  1.3 percent happened in department/discount stores.  1.1 percent occurred in specialty stores (TV, fur, etc.).  1.0 percent took place in drug stores/doctors’ offices/hospitals.  1.0 percent took place in grocery/supermarkets.  11.5 percent took place in other/unknown locations.  23.0 percent happened in or near residences/homes.  15.0 percent occurred in churches/synagogues/temples/mosques.  12.7 percent transpired at schools/colleges (based on three designations).  8.9 percent took place on highways/roads/alleys/streets/sidewalks.  4.0 percent occurred in parking/drop lots/garages.  2.0 percent took place in commercial office buildings.  19.1 percent took place in other/unknown locations. while saying a prayer that symbolically asks God to transfer the practitioners’ sins to the birds. practice takes place outdoors, on public streets in Brooklyn, and in full public view. enforce certain laws related to preserving public health and preventing animal cruelty. Kaporos v. New York City Police Dept. affirming the appellate court’s decision. and may not direct how the officer shall perform that duty. The U.S. Court of Appeals for the Eleventh Circuit, affirming a decision by a federal district court in Florida, has ruled that the City of Pensacola, Florida, must remove a 34-foot Latin cross from a public park. The circuit court concluded that the city’s maintenance of the cross violated the First Amendment’s Establishment Clause. A wooden cross was erected in the park in 1941. It was replaced in 1969 with the 34-foot version and subsequently donated to the city, which lights and maintains it at a cost of around $233 per year. Over the years, the cross has served as the location for an annual Easter sunrise program, and it also has been used as a site for remembrance services on Veteran’s and Memorial Days. In their lawsuit challenging the city’s support of the cross, the plaintiffs asserted that the cross’ presence on city property violated the Establishment Clause. The district court agreed, and the city appealed to the Eleventh Circuit, arguing that the cross did not violate the Establishment Clause under current U.S. Supreme Court precedent. The Eleventh Circuit agreed with the district court. The Eleventh Circuit then concluded that the cross violated the Establishment Clause as set forth in Lemon. The Eleventh Circuit acknowledged that the Supreme Court’s more recent Establishment Clause decisions seemed to have “substantially weakened” Lemon, but it pointed out that the Supreme Court had not “directly overruled” Lemon and, therefore, that its hand were “tied,” requiring it to affirm the district court’s order requiring removal of the cross. Importantly, the Eleventh Circuit’s decision may not be the end of the matter. That’s because the U.S. Supreme Court soon may decide to hear a case involving the Peace Cross – a memorial to American servicemen who died in World War I – located in Bladensburg, Maryland. If the Court accepts that case, Maryland-National Capital Park and Planning Commission v. American Humanist Association, it may clarify its Establishment Clause jurisprudence, with implications not only for the Peace Cross itself but perhaps also for the Pensacola cross. The Eleventh Circuit’s decision is Kondrat’yev v. City of Pensacola. 2018” into law. The new law strengthens protections for religious entities and their properties. 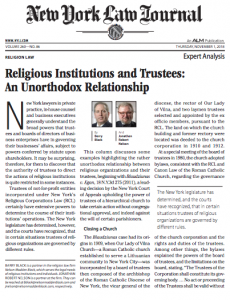 property” includes property that is leased by religious institutions. the Senate and the House in September. Orrin Hatch (R-UT), the bill’s sponsor, requested be placed in the Congressional Record. proud to sponsor this bill that will protect houses of worship and affiliate community centers. will provide a much-needed sense of comfort and security. But the Court fell short of answering the question of whether the same would apply if Colorado had acted more evenhandedly. The discussion is not yet over. The Court’s full decision can be downloaded here. 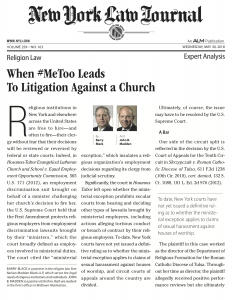 Under the ministerial exception, a minister’s discrimination lawsuit against his or her congregation cannot be sustained as violative of the First Amendment. Does this principle apply to sexual harassment claims? What if the harassment claim in no way involves the hiring or firing of the minister? The courts are split on this question. How will NY’s courts decide the question? Read the New York Law Journal’s most recent Religion Law Column by partners Barry Black and John Madden.